Rich History. Stunning Nature. Great People. The early beginnings of what became the World Famous Jackson & Perkins Co. can be see in the foreground. 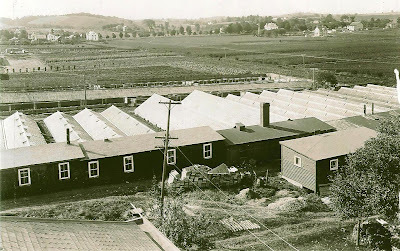 Note the greenhouses, stacks of wooden trays and rows of clay pots. Back then, Jackson & Perkins grew all kinds of nursery items for the wholesale trade. As large as J & P was then, they were not as large and well known as the C.W. Stuart Nurseries, also located in Newark. Shown in the center of this photo are the growing fields that became Perkins Park in 1926. George Perkins and his wife Caroline, who donated the land for the park had a tough time convincing his father to relinquish that land that had perfect growing conditions with Military Brook running through the property for irrigation. How did Military Brook get its name? Another story for another time. Sorry. The background of the photo is very interesting. A line of trees and a few homes border West Maple Avenue. What's missing? Perkins School-not built until 1928. Winspear/Hallagan's Pond doesn't appear to be there yet. Also missing is the RSE Trolley, located at the foot of the drumlin, now Woodhill property, was not built until 1906. And the Blakely Homestead, located at the end of what is now Brookview Dr. can be seen. The large house up West Maple Avenue, corner Elmwood can be seen, and a double house is under construction on Elmwood Avenue which was being developed. George and Caroline Perkins also donated land for a park in East Newark. The property at the corner of Hoffman St. and East Maple Avenue is now the site of Little League play, with three fields, lighting, and a picnic pavilion. It is often called Hallagan's Field because of the close proximity to the Hallagan furniture plant. However, a large boulder, on the corner clearly states Perkins Field, gift of George Perkins. You can make a comment, or trackback from your own site. 2 Comments to "Fun with Old Photos"
Great article, John! Pointing out those details is very worthwhile. Thanks for the history lesson. It also points out the importance of putting green space aside for future parks. Wayne County Life is an FLX Web Solutions community initiative. Copyright © 2009 WayneCountyLife.com. All rights reserved.